Attorney General Jeff Sessions came to town to talk to a room full of cops about fighting crime in the United States, from murders to human trafficking to drugs. Sessions said President Donald Trump is “finally” getting serious about protecting the nation’s borders. I suppose the thousands of Border Patrol officers, miles of fences, checkpoints and technology we’ve used up until now don’t count. But Sessions is a former U.S. senator. He’s allowed a little hyperbole. 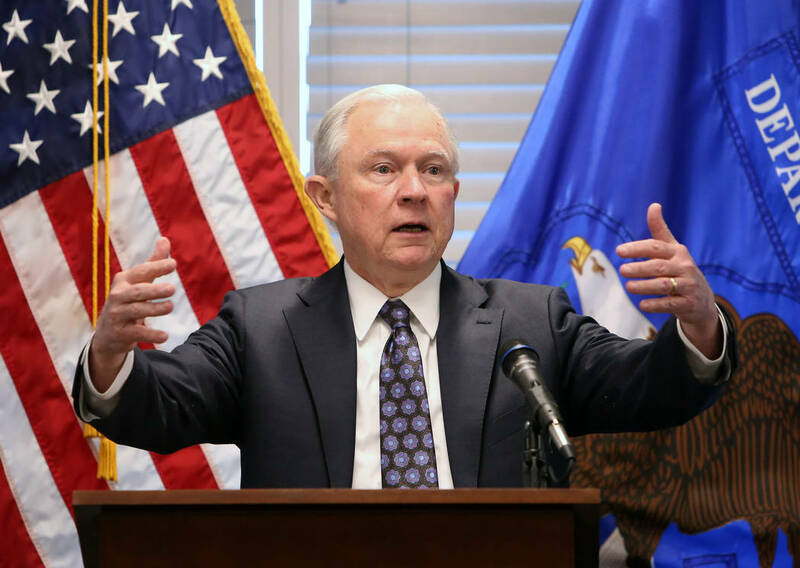 Sessions said he’d directed federal prosecutors to make crimes committed by immigrants who are in the country illegally a priority, and that the United States should remove unauthorized immigrants who commit crimes. I don’t know many people who think we shouldn’t deport undocumented immigrants who are convicted of committing violent crimes. There’s plenty of room for immigrants in the United States, but no room for those who prey on others. And yes, I realize that entering or remaining in the country without authorization is itself a crime. But if we’re prioritizing scarce law-enforcement resources — as Sessions says he’s doing — then we ought to put our focus where it should be, on crimes of violence that hurt people. That shouldn’t be a controversial stance. Democrats do have a point when they say a relentless focus on crimes committed by unauthorized immigrants paints the wrong picture. Only a small fraction of the immigrant community — legal and illegal — commit violent crimes. Talking constantly about criminal immigrants is like worrying you’ll catch Ebola when the flu kills far more people every year. President Trump and Sessions have raised the temperature of the rhetoric so high, it’s easy to understand that their justified focus on prosecuting criminals who are here illegally can inspire animus toward all immigrants, legal and illegal, law-abiding and criminal alike. But if Trump and Sessions talk too much about crimes committed by undocumented immigrants, Democrats may not talk about them enough. Rep. Ruben Kihuen, for example, greeted Sessions’ visit by criticizing the government for arresting non-violent unauthorized immigrants. “We will not stand for an immigration policy focused on breaking up immigrant families,” he said, saying the government should focus on only those individuals who seek to harm the country and its citizens. Again, the law is the law: If you’ve come here illegally or stayed here without authorization, you’re subject to deportation, even if you’ve committed no other crime. Kihuen is right to say that otherwise law-abiding (but unauthorized) immigrants shouldn’t be a top law-enforcement focus. But it couldn’t hurt if Democrats joined Republicans in saying the nation has no tolerance for violent criminals of any kind, including noncitizens. Barack Obama deported or turned away at the border thousands of immigrants who didn’t have permission to be in the United States, something that earned him scorn on the left and not enough credit on the right. But Obama’s approach was to focus on getting rid of criminals and repeat immigration violators first, a perfectly sensible policy. As for the majority of unauthorized immigrants who are otherwise law-abiding, think of it like a freeway. Usually, everybody is speeding, breaking the law. But good traffic officers concentrate their efforts on the most reckless drivers, because they’re the ones most likely to cause a deadly accident. But if you happen to get pulled over, you have to know that you’re going to face the consequences for speeding. Sessions noted in his remarks that a small fraction of the population commits the vast majority of violent crime, so it makes sense (and produces positive results) to focus on that small group. But that’s as true of immigrants (including the unauthorized ones) as it is of citizens. Let’s at least agree that the best policy is to start by targeting violent crimes, no matter who commits them, and to send those violent criminals home who weren’t supposed to be here in the first place.